The conservation movement has long had a troubled relationship with humans. Ever since Yellowstone was cleared of its native peoples and culture, the mission to preserve the Earth’s wild places has been beset by a drive to cleanse them of culture. Even further back, the wilderness of the Bible is uncultivated and stalked by bestial temptations. Colonialism, and then capitalism, rarely see anything beyond the resource value of the Earth’s wild places. This has fostered a view of nature that is acultural, driving a cleft between the natural and human worlds, and blinding us to how culture can enrich our relationship with Mother Nature and her progeny. Despite Humboldt’s observation, it is now known that the great forests of South America are not only culture rich, but that the whole ecosystem is likely the fruit of settlement and cultivation. Modern humans have made all ecosystems cultural sites, as our ancestors survived a dialectical dance with the elements that sculpted the landscape, our genes and our cultures. Languages, religions and ways of being change incessantly, but they are also irrevocably rooted in place, leaving echoes long after they are lived realities, and our communities are enriched by such deep belonging. Look out at any “oreum” (monogenetic volcanic cone) and you will not see pristine nature, as per the tourist brochures, but a product of culture, from its grazed slopes to its temple and potent geomancy. The tales we tell about our landscapes are powerful, and fire our passions, yet it is no surprise that a discourse replete with talk of ecosystems services, natural capital and branding struggles to inform a holistic and ethical approach to island stewardship. Jeju has a unique role to play in this conservation discourse following the news from the World Conservation Congress 2016 in Hawaii that the province is literally setting the standards for International Union for the Conservation of Nature (IUCN) protected area governance. There is no questioning the island’s pedigree — Jeju has picked up all four major natural science gongs in the last 14 years: Biosphere Reserve, World Natural Heritage, Global Geopark and Ramsar Wetlands — but I hope culture and nature stand shoulder to shoulder in the conservation guidelines that are to be spread worldwide. That looks to be an uphill battle, as Jeju is also leading the way in this marketized — and globalizing — discourse of “Nature Inc.” Also referred to as “green capitalism,” ecosystems have been linguistically reconstructed as service providers to the exclusion of other values. Jeju’s harsh natural environment kept water scarce, soils thin and yields low for centuries, so it is only right that villagers should prosper now that nature provides succour, not rancour. But the island’s nature is also an enchanting cultural masterpiece, and the IUCN could talk about that more. I was instantly reminded of an interview with a Hallasan National Park official in 2010 when I was told that locals were no longer permitted to perform rituals to the mountain god (“sansin”) within the park boundaries (although many continued to do so secretly, apparently). If we exclude such richness from our protected areas we culturally impoverish them, which ultimately fosters attitudes detrimental to their survival — Hallasan was crowned long before UNESCO’s Triple Crown, and it is a daily reverence that continues to this day. 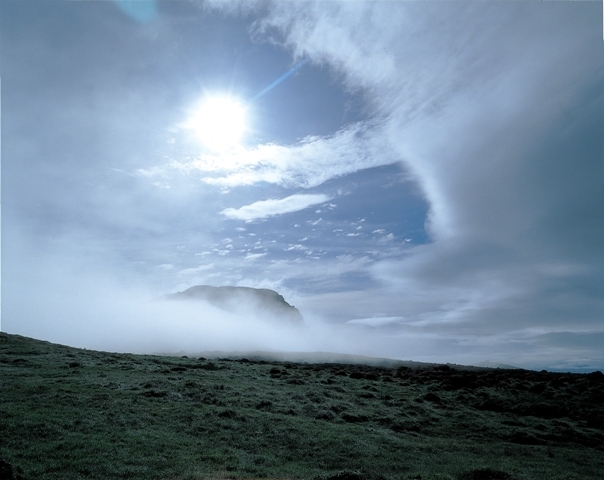 The whole of the Island, in fact, is a sacred landscape in the traditional animistic outlook found on Jeju. I want to see us talk more about how to ensure Jeju’s spiritual and cultural legacy is celebrated within Jeju’s protected areas, rather than a discourse couched in profit and consumption. The island’s cultural heritage, enshrined in its myths and rituals, bleeds into the island’s volcanic cones, caves and cliffs. An awareness that many islanders, even to this day, regard the island as sacred can influence the behavior of visitors, and promote positive relationships between our natural and cultural heritage. Such piousness toward the creation of Seolmundae Halmang is sorely lacking, as indicated by the recent discovery of open sewers emptying waste into our seas, disease threatening Hallasan’s crown of trees, and the disappearing Jungsangan grasslands on Her slopes. This kind of systematic damage would not disappear overnight, but an integration of Jeju’s traditional belief system within the dominant conservation and development discourse on the island would help foster more sustainable, and respectful, attitudes toward our ecosystems. All landscapes are flooded with meaning by the cultures living in them, so let’s ensure Jeju’s enchanting heritage continues to echo down Jeju’s deep green dells to enrich our discourse on the value of protected areas.